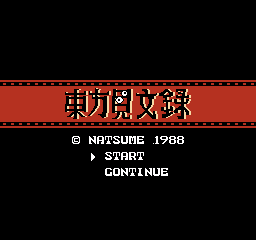 Natsume's debut title is easily one of the more disturbing of games for the NES, with creepy imagery and surprise jumpscares every other corner. 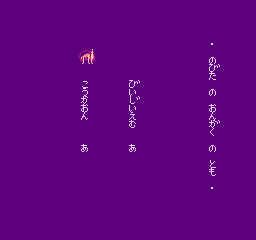 Has nothing to do with Touhou Project. Start the game while holding A on the second controller to end up in a sound test. It is controlled using the second controller: use Left / Right to switch between the two channels, Up / Down to scroll through the sounds/music, A to play music and B to play sound effects.